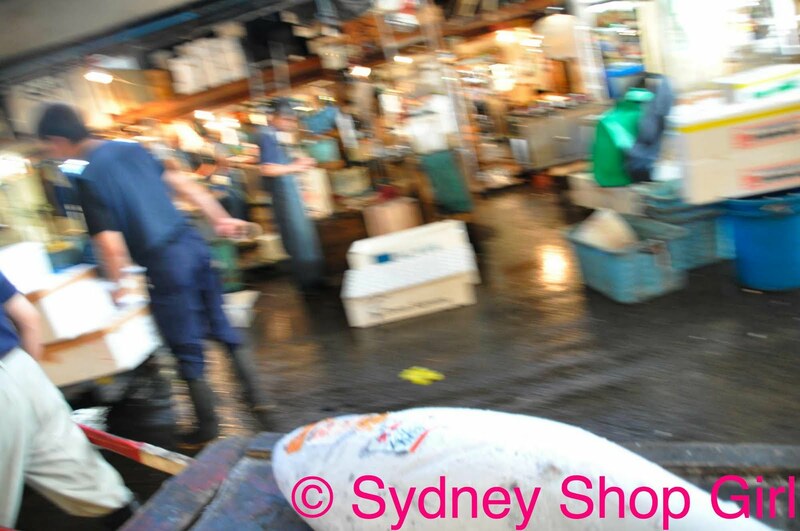 Sydney Shop Girl: Tsukiji Fish Market, Tokyo. There's only one reason I'd wake up before dawn whilst on holiday - food! 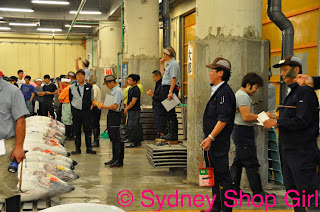 Mr SSG and I decided to go to the famous Tokyo Fish Market, the Tsukiji, on our second day in Tokyo. If we waited any longer, the early morning wake up would have been impossible to do. 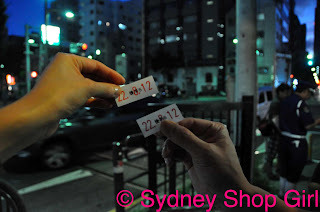 As the metro doesn't open this early, we caught a taxi to the market, it was only 20 minutes or so away from our hotel. We arrived at 4.20am and were 5th and 6th in line for the second tour. It was full 20 minutes later. 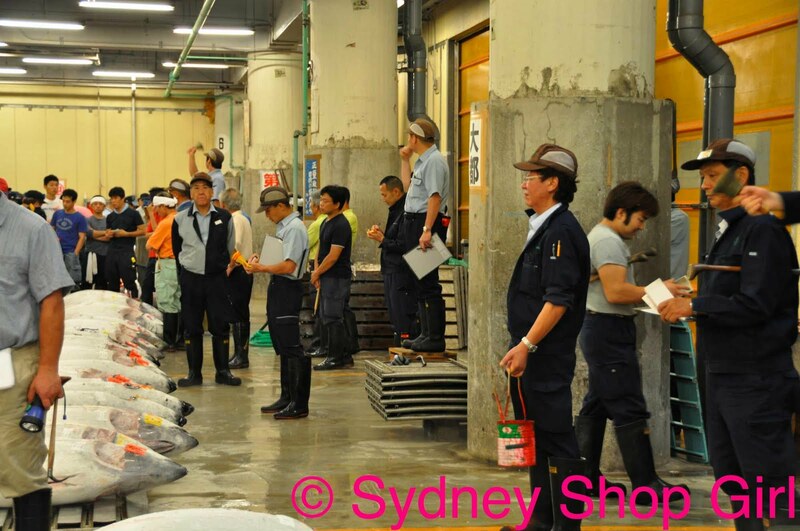 There are very strict rules for visitors to Tsukiji, especially for the key tourist event, the tuna auction. 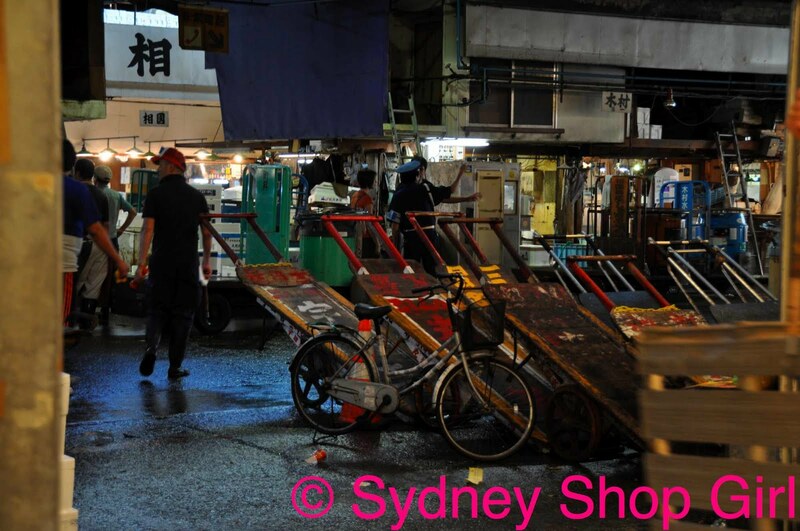 Behaviour was so disruptive that at one stage, the market was closed to all visitors in 2008. Thankfully, the auction is now open to visitors but there are strict limits to how many of us can watch and also where we are allowed to stand. 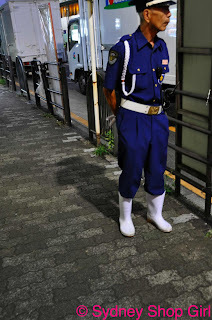 One of the helpful guards who counted us off and politely turned away the latecomers. 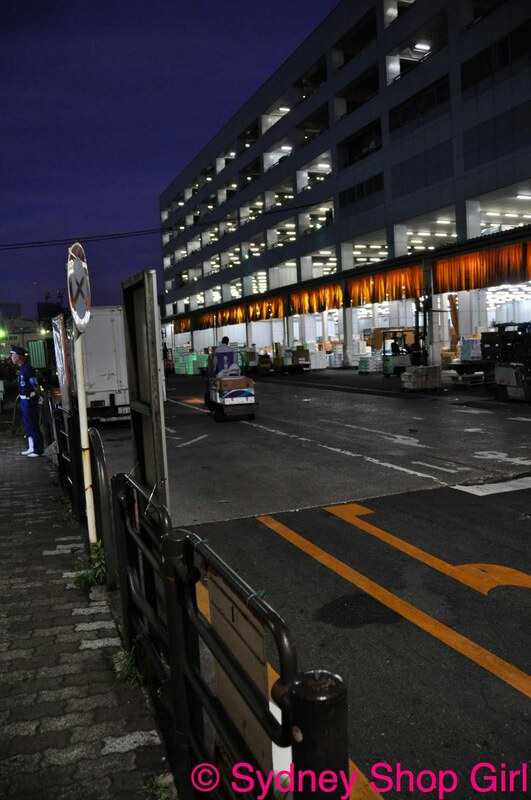 The market opens at 3am, when the fresh catches of fish are received and graded for sale. 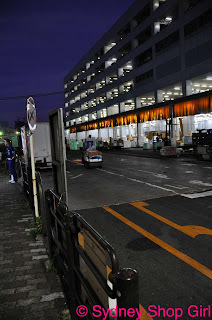 Tsukiji is around 400 years old and the businesses within the market are mostly family held and passed from one generation to the next. There is a special spoken language known amongst all those who work at the market, there are 9 letters for each of the 9 numbers and these are used to price and identify each fish. 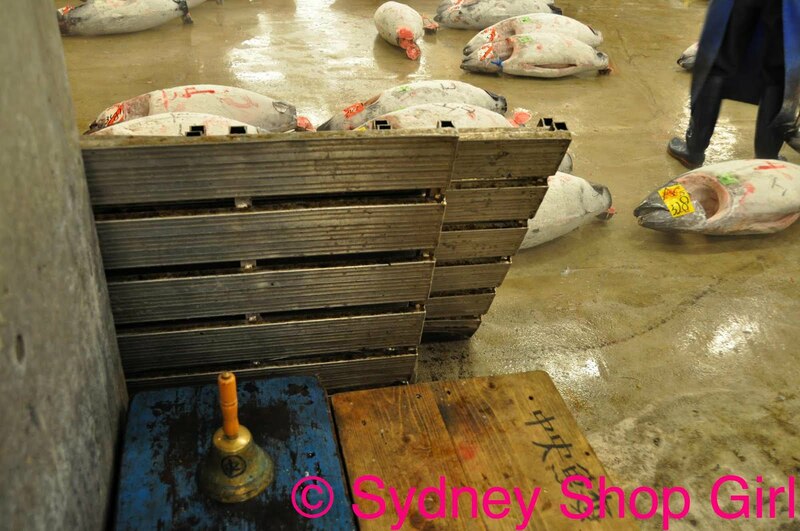 There are no marked prices on the seafood sold here. This secret form of communication enables 'flexible' pricing on seafood from one customer to another (depending on their loyalty to the vendor). There are 2 tours on each morning the market is open. 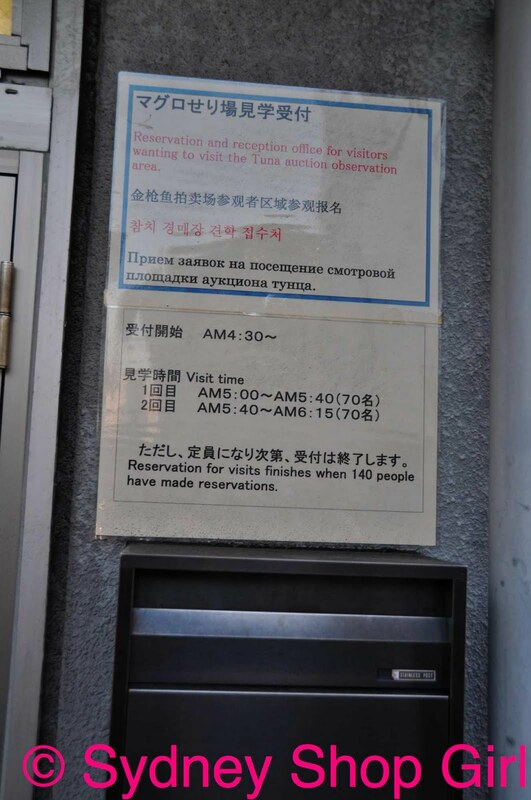 Each can only cater to 70 visitors. 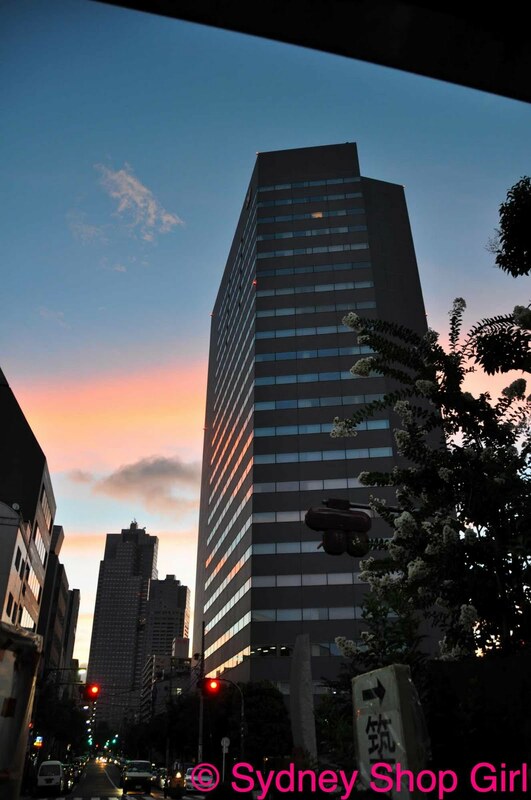 We were able to watch the sunrise over Tokyo as we waited in line outside the tour office. 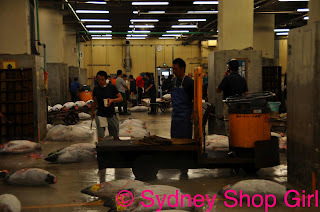 Not all areas of the market are open to the public and there isn't a conducted tour as such. There are people, bikes, trucks and produce everywhere so it's important not to stand in any one place for too long. The first group set off to watch the auction. Finally it was time for us to enter the tour office. 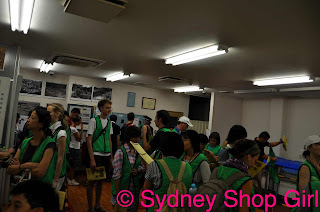 We were given coloured jackets to wear, to identify us as the second group of visitors. 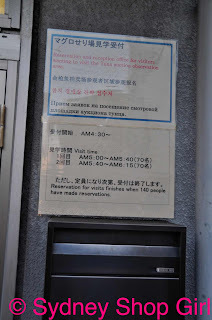 To kill some time, an excellent English documentary about Tsukiji was playing as we waited. I ended up sitting on the floor after putting on my jacket. 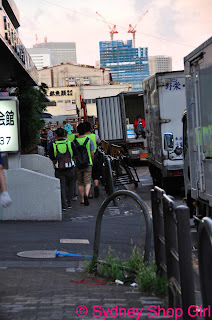 The documentary was very informative and really helped me understand what was happening around us at the market. Finally, our turn came. We were lead to the viewing area as the first group left. There was no time for happy snaps along the way. Frozen tuna is flown in from all the seas of the world each day. The auction companies (of which there are 5) grade the tuna and arrange it by size and quality for the auction. I don't think the general public can participate in the auction however sales to the public occur from 9am onward. Apologies in advance for all the carcass shots. 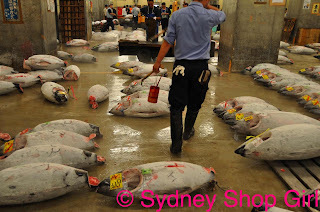 Despite the sheer volume of fish for sale, I did not smell a thing in the air in the whole time we were at the market. 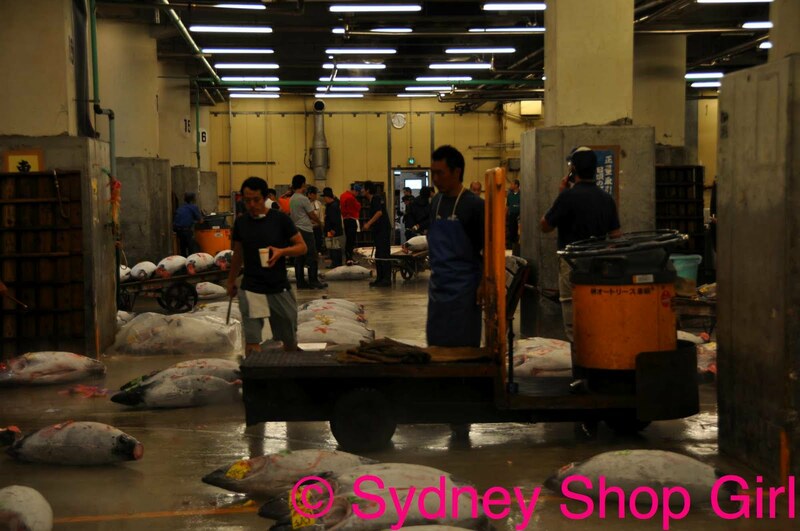 8100 tonnes of water flush through the floors of the market each day. I saw crates of fish from Australia and all over the world. 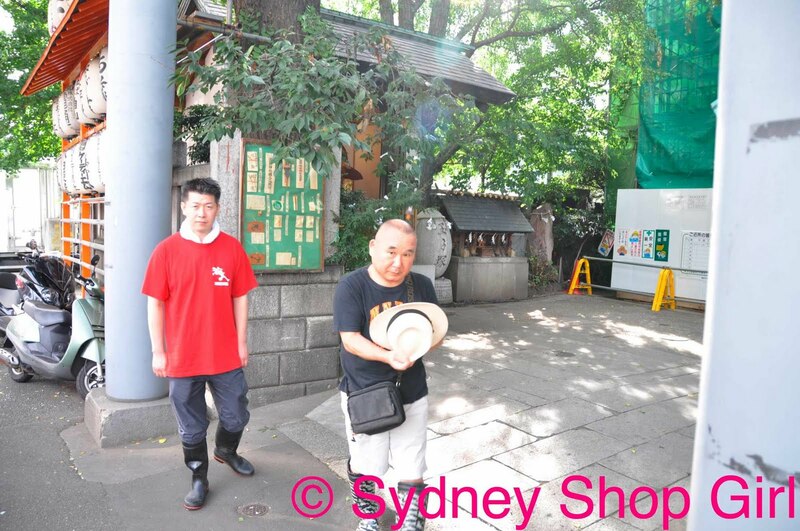 I wonder if the fish is flown air express from its country of origin? In the midst of such a high tech and fast paced city, it was a pleasant contrast to see plain old bicycles and trolley carts at work. 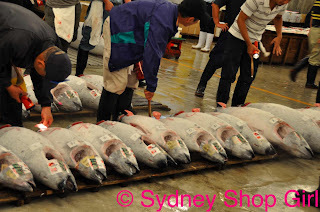 Graded tuna ready for inspection. I'm not sure what was on the table, but I think it may have been pieces of the day's graded tuna. The official mode of transport for both fish and humans at Tsukiji, the all electric "tahre" or turret trucks. The auction seemed to progress from the largest fish to the smallest. Tools of the trade: gloves, pick, brush and a can of paint. Not to mention the ubiquitous wellington books. 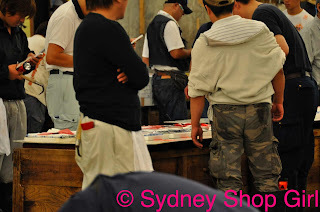 After a while, the milling buyers stopped browsing and formed little groups away from the fish. A good old fashioned bell to ring and a few wooden crates to stand upon. The only things an auctioneer needs beyond a resonant voice and the business of fish in his blood (I could see no women in the crowd of buyers or sellers). It was time for the auction to resume. With a shake of a bell, it was time to start bidding. 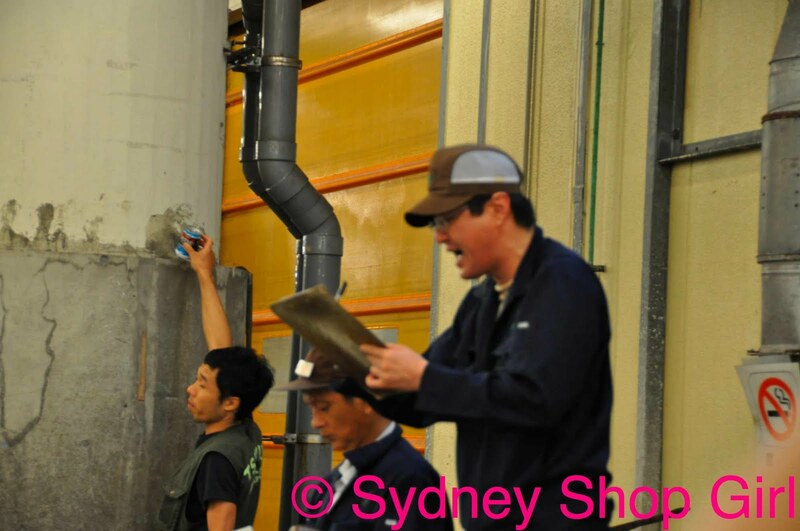 The auctioneers are responsible for the smooth running of each day's business. Without them, there would be no order and some very expensive fish would go to waste if sales did not run to a tight time schedule. 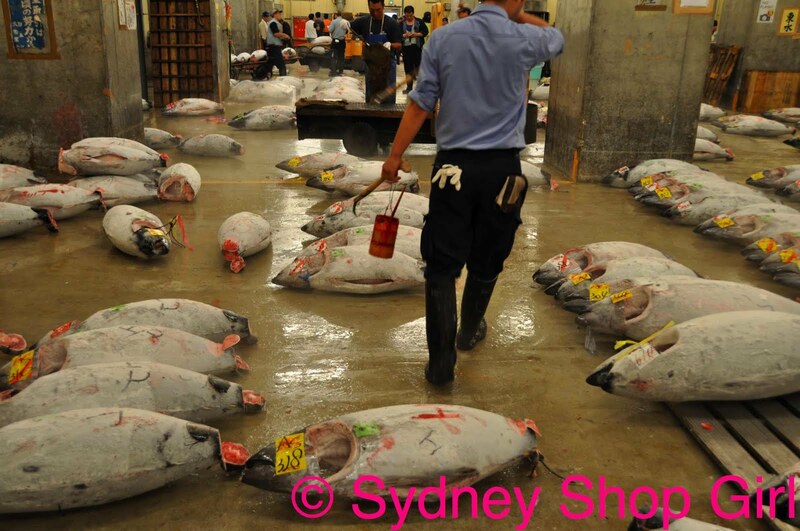 As each lot was sold, the auctioneer and his assistants would move forward in the room to the next row of tuna. There was constant motion everywhere we looked. 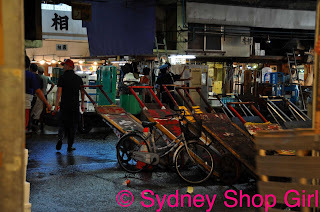 Another large part of Tsukiji is the market area. 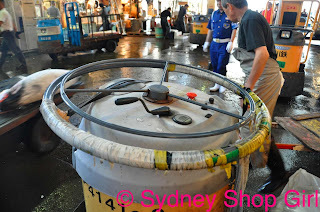 It reminded me of the Sydney Fish Market where it is possible to buy everything you need to make your seafood meal in the one spot. Some of the fresh produce on sale. 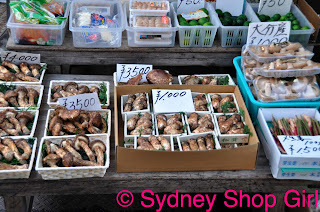 There is an astonishing array of mushrooms in Japan. The preferred footwear in the market is, quite sensibly, wellington boots. 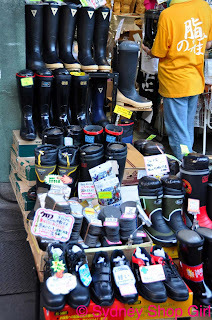 The stalls stock various styles of boot appropriate to different seasons and different jobs that their wearers may have around the wet area. It was hungry work getting up so early to watch the auctions. 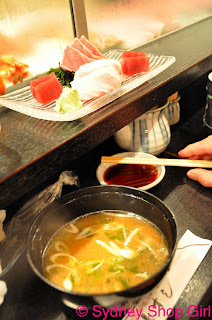 Mr SSG and I had a traditional Tsukiji breakfast of sashimi and sushi. Each of the restaurants are quite small and there were queues of hungry visitors outside each. The miso in Japan is a different beast to any other I have drunk. 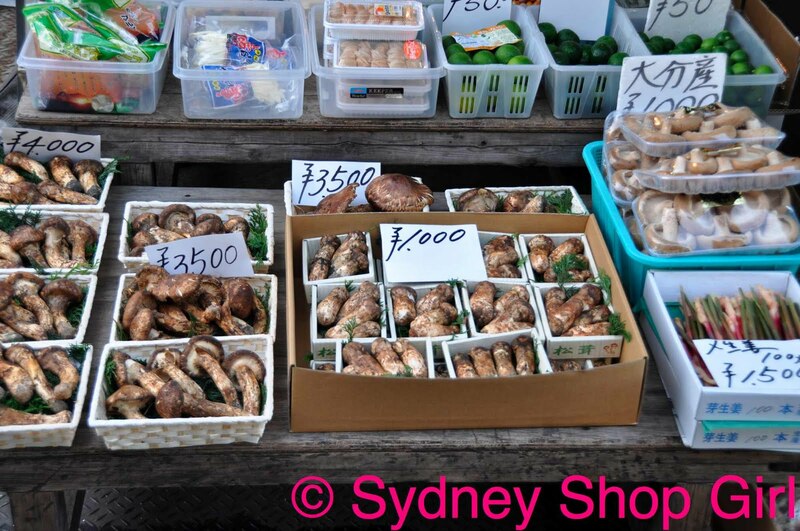 It tastes purer and fresh mushrooms are often added. 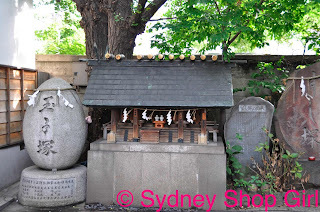 Before we left, we decided to visit the Tsukiji shrine. 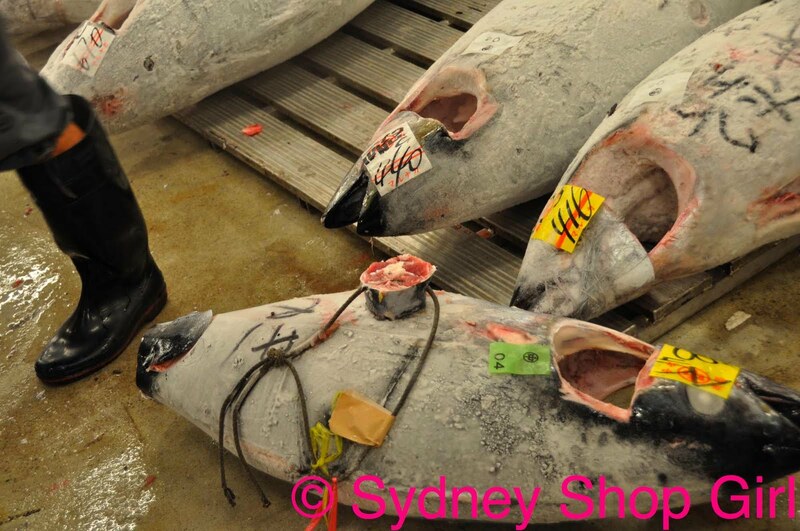 It is one way those that make their living from the capture and killing of fish resolve the violence that their business inflicts on the natural world. 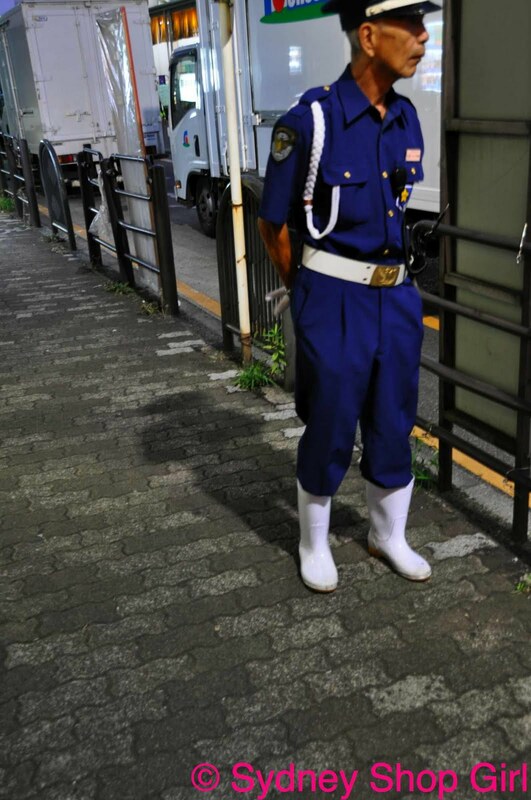 Many workers pay their respects here each day. 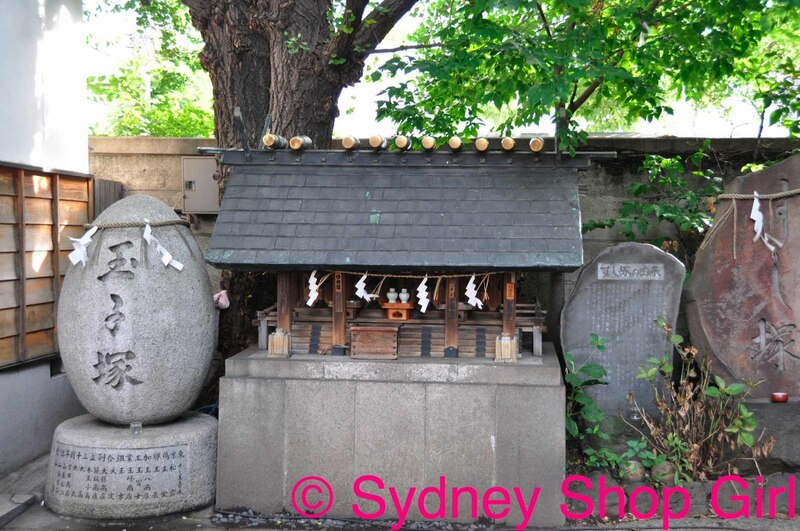 There are stone monuments and areas to leave prayers for the fish that have been killed. 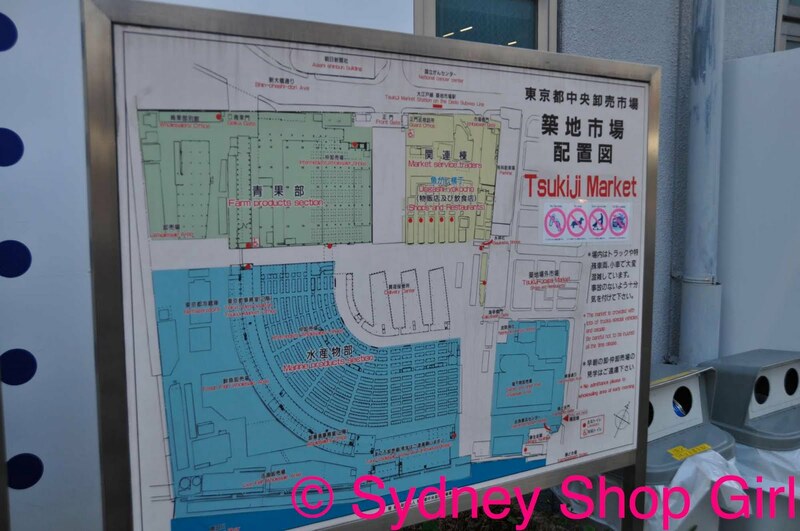 nice review on your tsukiji trip! Anonymous: thank you! Glad to help. Wow - what an amazing day. Thanks for sharing it with us.